Customer expectation is higher than ever before, people simply demand greater service from their brands these days. Our clients have to work harder to justify the loyalty or conversion of a new, shrewder consumer and service becomes a key differentiating factor in a congested marketplace. Service briefs get tricky, often born out of difficult business problems; the facts get slipperier and the points of difference get fuzzier, but that’s what makes them fascinating to work on. Creatives can’t just dress-up client messages anymore, we have to help elevate their business. If that involves digging deeper to find a voice that is credible and a creative platform that feels fresh & relevant, then out comes the shovel. Whilst partnered with Ian Edwards, we chose 5 case studies to showcase our creative approach, each one tackling a different service-related challenge. We have often worked closely with planners (both agency and client side) to help develop a strategy, before solving the creative brief itself and take comfort that there is a bit method, underpinning the madness. OBJECTIVE: Positioning O2 as the honest broker of broadband. WHAT'S THE STORY? As a late entrant to the broadband market, O2 asked us how could they leverage their award-wining service record to best effect. OUR SOLUTION: We said. “It’s all about claiming the high ground, and staying true to your customer champion credentials”. The market was littered with unscrupulous providers, bad practice was standard practice, people had come to accept common frustrations as the norm. We took these problems and gave them a name – ‘The Niggles & Narks of Broadband’: then set out to show how the internet had become contaminated by their annoying habits, and how O2 planned to eliminate them. Creatively the campaign lead us to new places, (we’d never written one in rhyme before). We created a legion of irritating creatures (all loosely based on people we know), how they looked and behaved, from their skin texture to personal ambitions. And working closely with a team of animators from The Mill we brought the Niggles & Narks to life. Our fully integrated campaign, including TV, cinema, print, DR press, cover wraps, retail, experiential, home page takeovers and digital media, led to O2’s highest upturn in brand affinity scores in years, and an award-winning, Niggle-Nobbling app. • Spontaneous awareness jumped from 16% to 28%. Consideration doubled from 12% to 24%. • We generated consumer and trade media interest, with the PR value of £576,804 in the first week of the campaign. • Facebook ‘Likes’ increased from 16,000 to 65,000. • There were 29,781 downloads of our Niggle-Nobbling app within the first 3 months and 125,483 new connections. • A ‘real-time, Niggle-Nobble-squad’ was set up to respond to customer comments or complaints. A number of website faults, missing information and some pricing inaccuracies were flagged-up and swiftly resolved, much to everyone’s delight. See more of this work on my O2 brand page or click the image below to view campaign montage film. WHAT'S THE STORY? In 2008 we helped VCCP win the Hiscox Insurance pitch and established an enduring brand identity and tone of voice. As a premium priced insurer, Hiscox’s true point of difference is in providing insurance that truly protects. Basically, if things go wrong, they pay up. In 2011, and in the depths of economic gloom, we created a film to articulate a philosophy and belief in the values the company was built on. Mr. Hiscox liked the film so much, he asked us to turn it into a brand campaign. Fast forward a couple of months and we found ourselves sitting in Ridley Scott’s office in Soho with Mr. Tomas Alfredson. He’d just won Best British Film at the BAFTA’s and narrowly missed an Oscar nomination for TINKER, TAILOR. We were delighted to hear that he wanted to make our script his next production. Film link below. In addition to the film, we created three 96sheet posters to run in prime sites across the South East. Shot by Stuart Hall, these executions underpinned the key Hiscox value/ethos of being there when they’re needed. 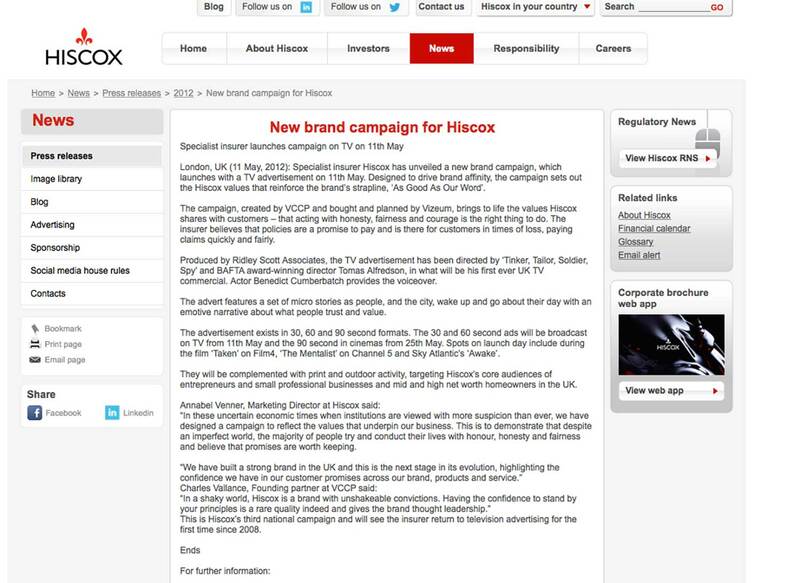 Click here to view the official Hiscox campaign press release. WHAT'S THE STORY? O2 asked us to help define a mission for their internal audience. We had to communicate their desire to play an increasingly vital role in their customers’ lives. O2’s CEO, Ronan Dunne launched our 2 minute film at their top 400 executive conference. We laid down 6 simple behaviours that would help O2 turn customers into Fans. Our approach was well received and gradually introduced to the 12,000 strong UK work force. And later reached a wider international audience when 02’s parent company Telefonica, also adopted it. COVERAGE & FEEDBACK: Fanbook became part of O2’s DNA and is still played to every new employee. It spawned a series of follow-up projects and secured a tidy little ‘corporate comms’ revenue stream, as well as bringing VCCP’s strategic role into sharper focus for Spanish telecoms giant Telefonica. Click image below to view Fanbook film. WHAT'S THE STORY? Every year Metro Newspaper throw a bash for their favourite people, media buyers. But for this assignment they chose to educate and entertain, rather than schmooze and booze. We developed an integrated B2B campaign to showcase the depth, range and effectiveness of Metro’s communications platforms at reaching its ‘urbanite’ audience. In a carefully phased campaign running across several weeks, we targeted our audience through as many different media channels as possible. Our octopi emails, chewy- tentacle DM packs, viral creature movies and blogs, directed media-bods to a unique microsite, (navigated by its own user-feely, tentacle-tool) to play and win coveted prizes whilst learning lots of exciting stats about the many arms of METROCTOPUS. COVERAGE & FEEDBACK: Let it never be said that our media buying community lack competitive edge or ingenuity. We had to disqualify one agency (who shall remain nameless) for attempting to hack into our competition leaderboard in their pursuit of METROCTOPUS glory. View the case study montage below. See the campaign on my Metro brand page. WHAT'S THE STORY? O2’s Sponsorship of Academy music venues, seemed like a cast iron opportunity to bring some dynamism and rock ’n’ roll to O2’s retail experience. We suggested turning every O2 store nearest a venue, into a music hub. We would make it advantageous stop off point in any music fan or customer’s journey. Reward and motivate staff by making them part of something new and exciting. Provide a unique role for the store within the community and generate a ton of footfall and cashtill action. As O2 pondered our proposal and wrangled over costs and store space, we took advantage of a stills shoot at Brixton’s O2 Academy. We’d been commissioned to build an image library, capturing the atmosphere of the Academy Venues. But we felt there was also another unique opportunity to provide great branded content. I exploited our photographer’s motor drive and cut together a film (from over 2000 stills) to immortalize the memory of your O2 Academy night out. COVERAGE & FEEDBACK: Two music journalists said this was exactly the kind of content, (a digital souvenir), music fans would kill for. The head of Channel 4 Music got excited. A lot of internal politics and wrangling later, we went round and round, crashed and burned and landed absolutely nowhere. But we tried goddammit! We tried! View the PDF presentation here. See the film below.